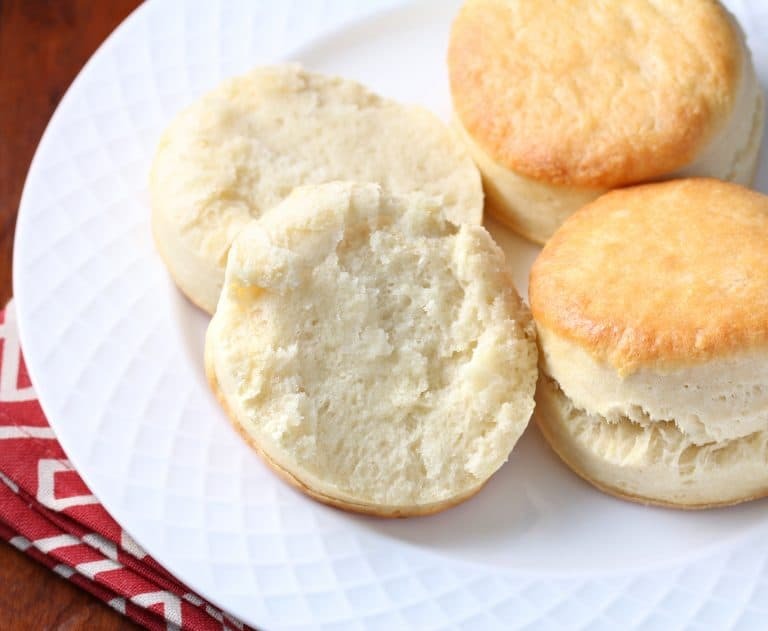 Hands down the softest, fluffiest, flakiest, most tender buttermilk biscuits EVER! In a word, they’re simply the BEST! I have to tell you I’ve never been a fan of baking powder biscuits. I’ve always found them too dry and too bland. And some of them are really better served as door stoppers. But my opinion did a 180 the moment I bit into one of these. I’ve said it before but I will say it again: Lard makes the baking world go ’round. And that’s no revolutionary secret. That was commonplace knowledge up until the early 20th century. Until Crisco came along with it’s massive marketing dollars and decided to demonize animal fat in order to push the supposed health benefits of hydrogenated plant oils. And as we say, the rest is history. With that came an uprise in chronic disease like we’ve never witnessed before. Our ancestors were wise. Use what nature gives you – real, whole ingredients – and avoid the processed stuff. And here we are today, having finally come full circle with medical research once and for all debunking the animal fat myth. Hallelujah! Read more about this topic in our article about lard. So now that we’ve come to our senses, let’s talk LARD. To make the BEST biscuits you have to use it! 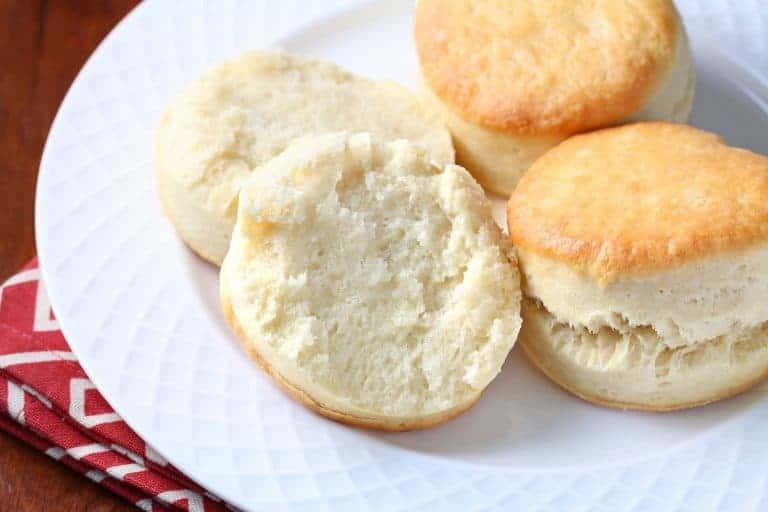 If you have never made biscuits with lard you are in for a wonderful treat. Truly, you have never had softer, flakier, more supple biscuits in your life. In a nutshell, the flour particles and gluten strands in dough form strong bonds when baked, which means a tougher crust. Lard works by coating these particles and strands which weakens their structure. This prevents those strong bonds from forming and creates a flakier, more tender crust. Lard also has a higher melting point than butter, for example, which means it melts more slowly throughout the baking process, creating air and steam. The fat crystals in lard are also larger than butter which means tons of tiny, airy holes are left behind as the lard slowly melts. The result is even more flakiness, leavening and lightening of the texture. I discuss this in detail in my article about lard, but in short, do not use the lard you find at the supermarket. Turn it around and look at the ingredients and chances are it is hydrogenated lard. Put it back on the shelf. You want pure, natural lard. Specifically you want what’s known as leaf lard. That’s the white fat surrounding the kidneys of the pig. It is more neutral in flavor compared to the other fat in the pig and will contribute the texture you want for your pastries. Lastly, make sure you get your lard from a trusted source. Much of the bad stuff we eat gets stored in our fat. The same is true for animals. You don’t want to eat condensed toxins in the form of lard. Find a local farmer or butcher that can sell you leaf fat from responsibly raised pasture-raised pigs. A healthy pig means healthy fat. You can buy leaf lard from pasture-raised pigs but it’s terribly expensive. Instead, make it yourself! It is so, so easy and SO much cheaper, you can seriously make like a gallon of it for the same cost as a small jar! All you need is fat and either a slow cooker or a pot. 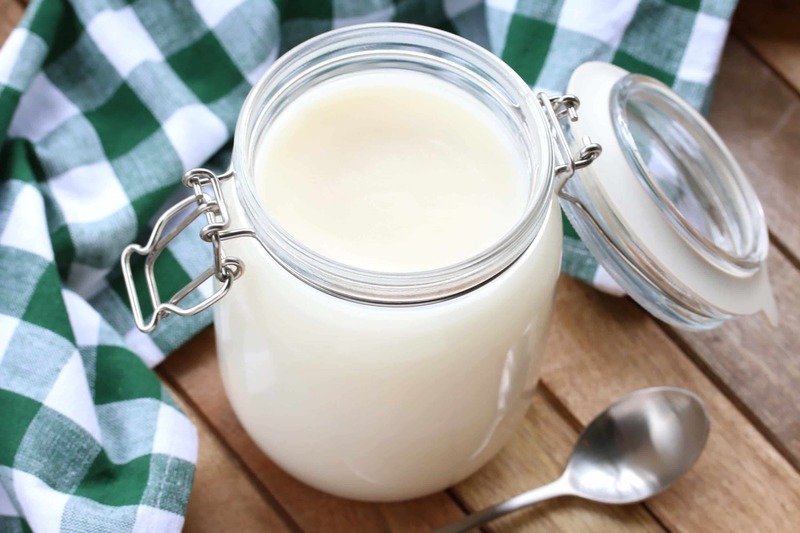 Check out our article on How To Render Your Own Lard! With this magical ingredient in hand, you are ready to do some seriously good baking! So let’s make the softest, fluffiest, flakiest, most tender buttermilk biscuits EVER! In a large bowl combine the flour, baking powder, baking soda and salt. 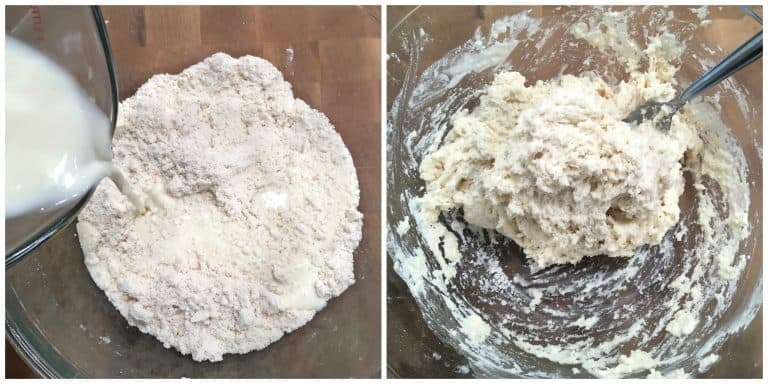 Add the lard and cut into the dry ingredients using a pastry cutter or fork (you can also pulse it with a food processor) until it resembles coarse crumbs. Add the cold buttermilk and stir it until just barely combined (a few little lumps are fine), be careful not to over-stir. (If adding any herbs or cheese, add them in with the buttermilk.) The dough will be fairly wet, this is normal. Flour a work surface and turn the dough out onto the surface, using floured hands to very gently pat the dough until it’s uniformly 1 inch thick. 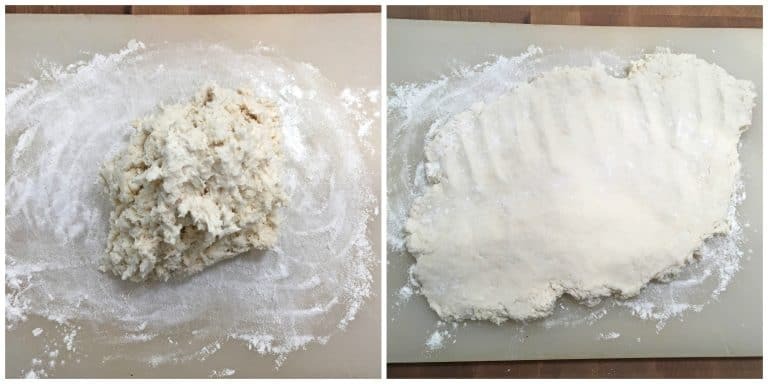 Gently fold the dough in half, turn it 90 degrees, then fold it in half again. Wrap the dough in plastic wrap and chill in the fridge for at least 30 minutes. 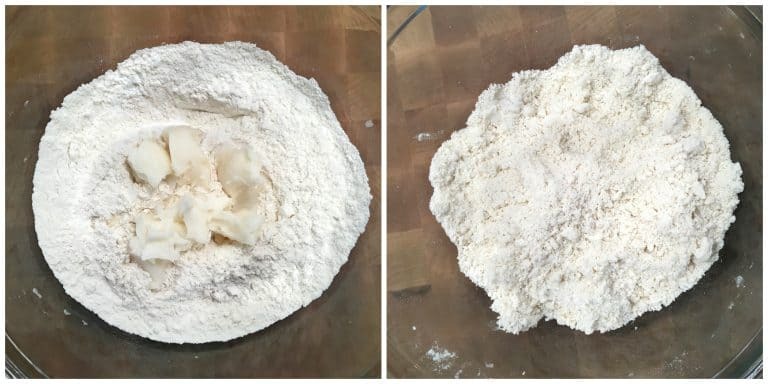 On a floured work surface, gently pat out the dough to 1 inch thick again and use a 3″ round biscuit cutter (lightly floured) to cut out rounds, pressing straight down and pulling straight up without twisting or wiggling the cutter. Gather up the scraps, gently knead them together and pat the dough out to 1 inch thickness. Cut out the remaining rounds. Place the biscuits on a lined sheet pan and bake for about 12 minutes or until the biscuits are golden brown. Brush the hot biscuits with butter (the biscuits will readily absorb it). Serve the biscuits immediately while warm. 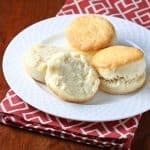 Hands down the softest, fluffiest, flakiest, most tender buttermilk biscuits EVER! In a large bowl combine the flour, baking powder, baking soda and salt. Add the lard and cut into the dry ingredients using a pastry cutter or fork (you can also pulse it with a food processor) until it resembles coarse crumbs. Add the cold buttermilk and stir it until just barely combined (a few little lumps are fine), be careful not to over-stir. (If adding any herbs or cheese, add them in with the buttermilk.) The dough will be fairly wet, this is normal. Flour a work surface and turn the dough out onto the surface, using floured hands to very gently pat the dough until it's uniformly 1 inch thick. Gently fold the dough in half, turn it 90 degrees, then fold it in half again. 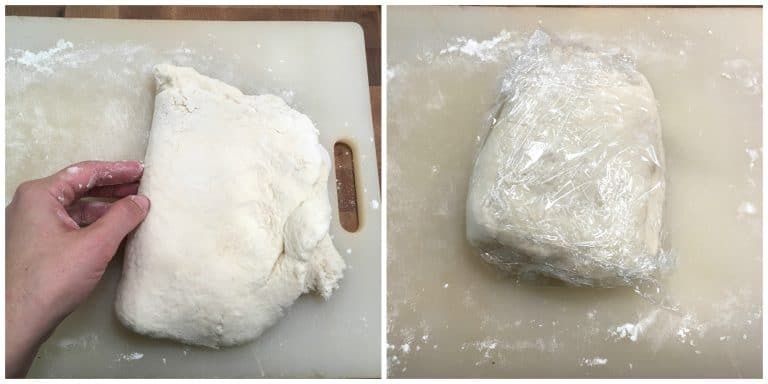 Wrap the dough in plastic wrap and chill in the fridge for at least 30 minutes. 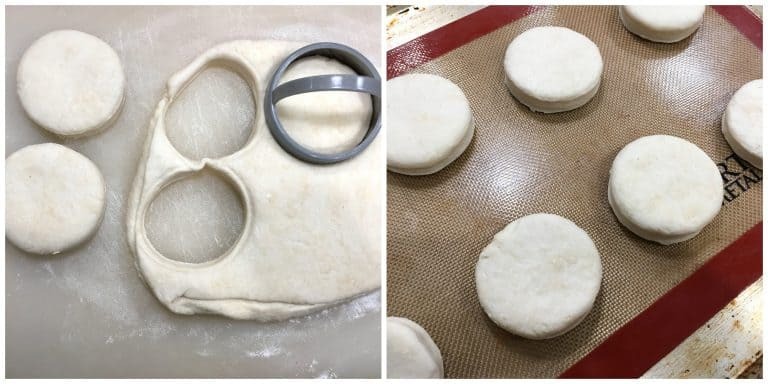 On a floured work surface, gently pat out the dough to 1 inch thick again and use a 3" round biscuit cutter (lightly floured) to cut out rounds, pressing straight down and pulling straight up without twisting or wiggling the cutter. Place the biscuits on a lined sheet pan and bake for about 12 minutes or until the biscuits are golden brown. Brush the hot biscuits with butter (the biscuits will readily absorb it) and serve the biscuits immediately while warm. I love these for the holidays! My weakness. MMMM! 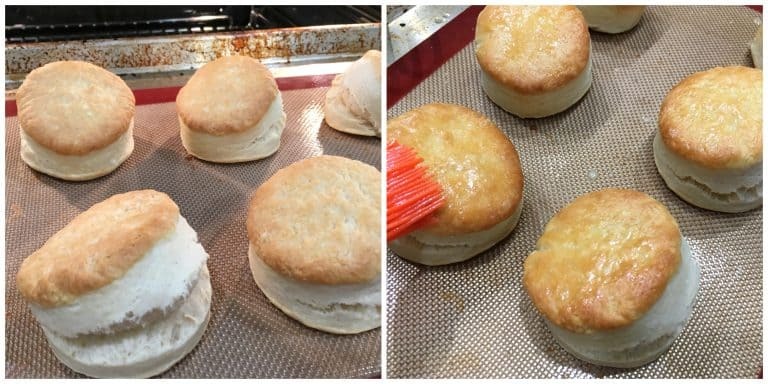 Living in the south, people take their biscuits very seriously! These look really tasty and I can’t wait to try your recipe and share it with my family! Look so tender and fluffy. Of course I want to try. And I save your impresses recipe. Looks VERY tasty! So excited to make these! They look delicious! Pillows of heaven!!!! These are perfect for my sausage gravy. I love these with a nice saucy meal, or for breakfast even! Oooh the perfect addition to any meal! I am definitely craving these buttermilk biscuits! They look fabulous! Oh my! These biscuits are amaaazing!! YUM!! I have to ask… what are biscuits and what do you eat them with? In England, biscuits are a very different thing! Hi Faye, I had the opposite question when I first moved to England :) Biscuits in England are called cookies in the U.S.. In any case, biscuits in the U.S. are essentially bread rolls made without yeast, similar to scones. You eat them with butter, jam, honey, etc, and are also popular in a dish called biscuits & gravy. Thanks Kimberly. I’ve always wondered. Biscuits and gravy is a very strange combo to me! I am all about buttermilk biscuits! Have to make these! I found these easy to make. They came out perfectly golden brown outside, and inside beautifully puffy and flaky. Will be making them again and again.I love these biscuits! 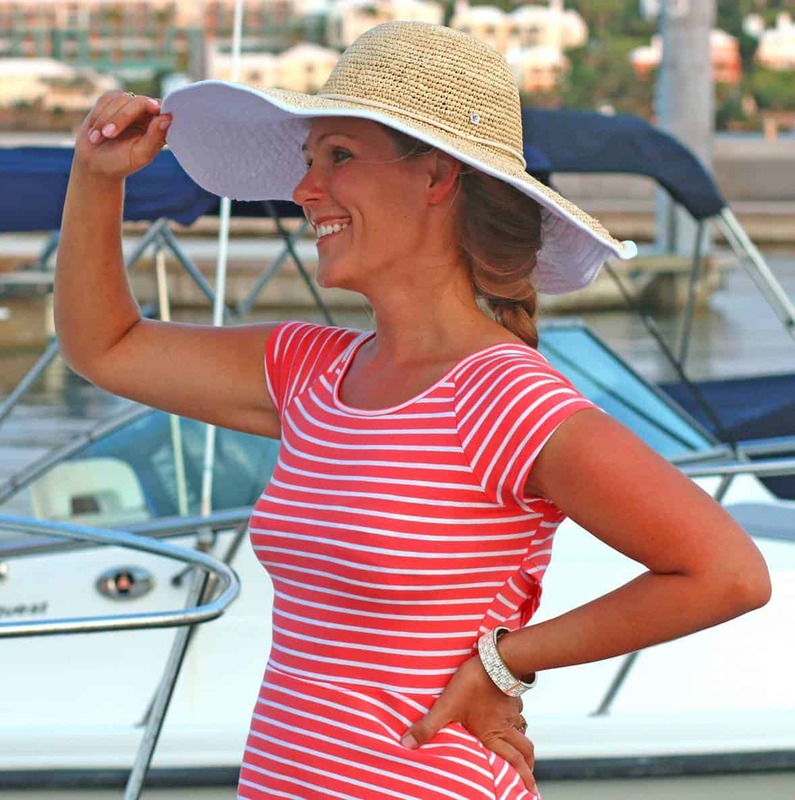 Thanks for your sharing! I’m thrilled to hear that, Anthony, thanks so much for the feedback! These biscuits look really perfect! PHENOMENAL!! Every bit as good as you described. And yes, I even used my own homemade rendered lard. No other biscuit recipes from now on, THIS is the BEST!! I’m so happy to hear that, Cori, thank you! oh I can’t wait to make these! I don’t comment a whole lot on your site but I do love love your site please don’t ever stop what you’re doing. You bring back so many memories of a fun little old lady with gray hair, making the best biscuits this side of the hemisphere and yes she only use lard good old-fashioned lard and wouldn’t you know, I just happen to have a mason jar full of leaf lard as we speak. So this recipe is so on time I’m going to see if I could do my Grandmama and Mom proud if they were alive!